Recently, I had an experience that made me think about how I go about prescribing exercises. It also made me think about a story I heard on the radio. John Wooden is famous for being the head basketball coach for 27 years at UCLA and won a record 10 NCAA championships in 12 years at one point. He coached some of the greatest basketball players of all time while at UCLA. Every year he started off the basketball season with a very important lesson. Get back to basics. Not the basketball basics of dribbling a basketball, or passing, or defense. More basic than that. Much more. How to put on your socks and shoes. Every year the first practice he would have his players (some of the best basketball players in the country) sit in a circle, take off their shoes and socks and re-learn how to put them on the correct way. He would teach them how to pull their socks on so there were no wrinkles or seams that might give them blisters. Blisters meant less playing time and practice time. He would teach them how to lace up their shoes and tie them so they would support their feet the best, and not come untied. 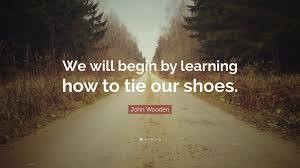 Again if shoes come untied you'd have to come out of the game or stop practice and that is bad for everyone. Then, and only then, could they start to play basketball. Doing this properly, it was said said, was the initial lesson for "everything we would need to know for the rest of our lives." Here is a link to a story about this. Now what does that have to do with my experience and exercises? Well, I was in the gym, lifting weights and decided that I would put a little more weight on the squat machine. I was feeling good getting stronger and wanted to push myself a little bit. I added the weight and did a few sets and actually felt pretty good. It was hard, I concentrated on my technique, and I felt fatigued but didn't have any pain...until the next morning. I woke up and my lower back was tighter than I can remember it ever being. Rolling over was tough, walking was stiff, and bending... well, no thanks. My back muscles were in that state of protection and I could feel my pelvis tilting forward, my spine stiff. If only I knew a good physical therapist. Wait. I do. So here's what I prescribed myself. A 90/90 hip lift. Thats it. Nothing else (except some ice and ibuprofen). Focus on gentle pelvic tilt, feel hamstrings engage. Slow, full, gentle exhale. Relax into it. Pause. Full, gentle inhale. Repeat. 5 sets of 5 breaths 2-3 times a day for a few days and it felt great. Sure I didn't really hurt myself that bad. I got better quickly. But, I also just focused on the basics. When I got to work I went about my day and realized with some of my patients I prescribed exercises that are great but have lots of pieces to them and may have passed over the basics too quickly. I was working on proverbial basketball skills like dribbling, defense, and passing but forgot to teach my patients how to put their socks and shoes on. So my technique for the last few weeks has been a 90/90 hip lift. Nothing fancy. Just do it and see how you feel. If you can do that we can add more to it. We will probably need to, but lets make sure we get the basics down. It was good enough for me. Should be good enough for my patients as well.